SIME Darby Property Bhd (Sime Property), the property arm of conglomerate Sime Darby Bhd, is inviting bids for two prime parcels of land in Kuala Lumpur and on Penang Island. 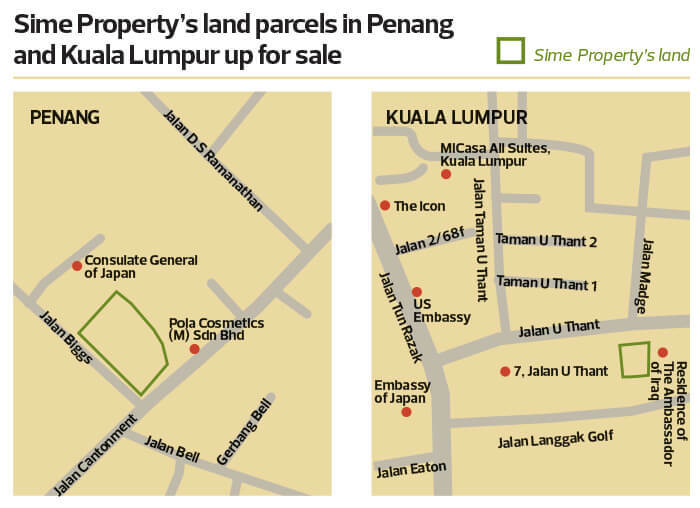 Together the parcels may be able to fetch Sime Property over RM80 million. The land in Kuala Lumpur is located in the upscale U-Thant area near the US Embassy while the piece in Penang is in the affluent area of Pulau Tikus. “Sime Darby Property has earmarked the 1.16-acre parcel in Jalan U-Thant, Kuala Lumpur, and the 1.71 acres in Pulau Tikus, Penang, for disposal as they do not come under the company’s key development focus, given their small size. The parcels are intended for residential use and proceeds from the monetisation exercise will be used for the company’s future developments in key growth areas,” a company spokesperson tells The Edge when contacted. Sime Property has 20,695 acres in total and ongoing projects of RM81.5 billion in gross development value. It has hired real estate consultancy Rahim & Co as the exclusive marketing agent to conduct the tender exercise for the Kuala Lumpur parcel and CBRE | WTW as the exclusive marketing agent to seek bidders for the Penang parcel. Rahim & Co is advertising the Kuala Lumpur parcel as “a rare acquisition opportunity in the prestigious diplomatic and high-end enclave that is ideal for luxury residential development”. The 50,530 sq ft land, situated next to the residence of the Iraqi ambassador and facing Jalan Madge, has a long frontage of 208 ft with an average depth of 250 ft. The closing day for submission of the tender is Aug 29, 2018. When contacted for more details, Rahim & Co estate agency director Robert Ang declined to comment, citing confidentiality. Sime Property’s prospectus issued ahead of its listing last November provides additional details of the Jalan U-Thant land. It is currently vacant and approval has been obtained for a luxury residential development. The audited net book value of the land as at June 30, 2017, was RM3.15 million while the market value was RM44.1 million. Documents show that in 2013, Sime Property obtained approval for a low-density luxury condominium with 18 units. Industry sources say the land may be able to fetch as much as RM900 psf, which values it at RM45.48 million. Last year, an 18,730 sq ft parcel in Jalan U-Thant, situated just 300m from Sime Property’s, was purchased by Senja Dinamik Sdn Bhd from Wonli Investment Co Sdn Bhd for RM13 million. This works out to RM694 psf. Nearby, in Jalan Langgak Golf, which is parallel to Jalan U-Thant, a 16,695 sq ft parcel was purchased by Cocos Sdn Bhd from the German government for RM30 million or RM1,797 psf. It is understood to be a commercial plot. Meanwhile, a search on the Companies Commission of Malaysia’s website shows that Cocos is owned by Tan Sri Dr Ninian Mogan Lourdenadin (99%), who runs MBf Holdings Bhd, and his wife Puan Sri Matrona D’Cruz Tharsis D’Cruz (1%). Another notable transaction in Jalan U-Thant is the purchase of a 13.7-acre or 596,767 sq ft parcel by Lembaga Tabung Angkatan Tentera from the Federal Lands Commissioner for RM334.79 million in 2013. The purchase price for the land with a lease expiring in 2112 works out to RM561 psf. As for the parcel in Penang, a tender brochure sighted by The Edge says it is a 74,488 sq ft freehold, First Grade land in an affluent and exclusive residential area. Located on the corner of Jalan Cantonment and Jalan Biggs, it is 2km from Gurney Plaza and Gurney Paragon shopping malls and about 10km from the Penang Bridge and 20km from the Penang International Airport. CBRE | WTW declined to comment when contacted. The closing date for the tender is Aug 29. A Google Earth search reveals that a double-storey bungalow is sitting on the parcel. The address of the asset is 2A Jalan Biggs. According to Sime Property’s listing prospectus, the built-up area is 10,478 sq ft. Its net book value as at June 30, 2017, was RM1.63 million while market value was an estimated RM37 million.